What Are The Different Size and Weight Limitations For My Pallet on a Conveyor Elevator? 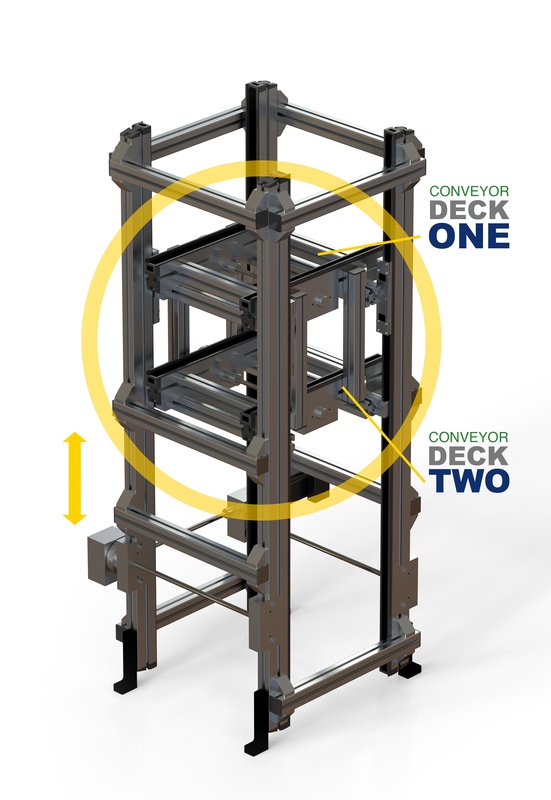 Vertical transfer units (VTUs – otherwise known as pallet elevators) can perform functions that would otherwise require another piece – or multiple pieces – of equipment within a conveyor system. This solution saves the space that would have been taken up by ancillary equipment and makes the automated conveyor system more efficient to operate, assemble, and maintain. But one question we frequently receive about these vertical transfer units is about size and weight capacities. An elevator’s weight and control capacity depends on how fast you need to move the product through your automated process and how fast it needs to be elevated. Much of the capacity comes down to stepper or servo sizing. 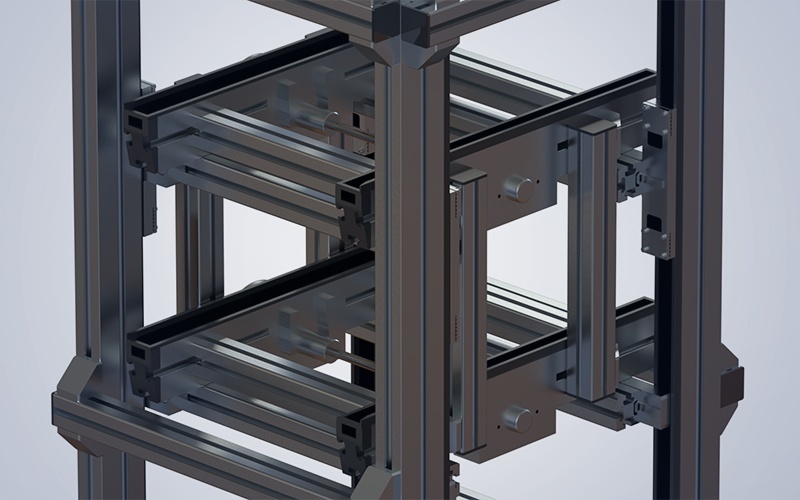 In general, our conveyor elevators can accommodate heavier weights (than traditional VTUs) in less space because we’re using four stands to support the conveyor deck; many of our competitors use only a single pneumatic cylinder with a cantilevered load. We also know that stepper or servo-driven lifts give much more control within a conveyor elevator since they’re able to slow gently, compared to a cantilevered pneumatic lift that has only two stops and one speed (can you say “slip-stick effect?”). Plus, steppers and servos have built in encoders for positioning accuracy. Both of these aspects greatly increase conveyor precision and location accuracy. an economical solution for your client’s bottom line. Glide-Line’s stepper and servo-driven pallet VTUs support the product in all four corners to increase conveyor precision; most competitors’ pneumatic elevators cantilever the product instead, only supporting the pallet on one side. We can adjust the entire shaft in one millimeter increments, so there are no size restrictions for either product or elevator. Glide-Line’s conveyor assembly process is built to be the most efficient it can be, often shortening lead times by half compared to other manufacturers. To accomplish this, our VTUs are built with common conveyor components. This simplifies both the design and build, plus leads to faster training and simpler maintenance by our customers when needed. Our pallet elevators (VTUs), like our conveyors, are built as standard custom sizes – meaning that customizations for size and weight capacity are standard using our flexible building process. You (and your client) aren’t paying more to get exactly what you need. A flexible conveyor manufacturer like Glide-Line can deliver any size lift that’s needed, rather than you adjusting or compromising your design to fit a standard size. You also don’t need to add extra devices to support large products or control back-pressure for fragile products. Using stepper or servo-driven VTUs creatively in your design, you’re able to achieve precise positioning accuracy, reduced lead time, and an economical solution for your client’s bottom line.